Patrick William Lee was born August 5, 1947 to George P Lee and Leslie A Lee (Warren) in The Dalles, Oregon; he passed away Feb. 8, 2019 in Reno, Nevada. He was raised in Fossil, Oregon until 1963. His parents moved Patrick and his siblings to Goldendale, Washington where he graduated from high school in 1965. Patrick went to Yakima Community College for a year and worked for Frank Beard. He then enlisted in the Marine Corps in 1968. While stationed at Camp Pendleton, Patrick became interested in saddle making from his great Uncle Wade Warren, a saddle maker for Visalia Saddlery. This would shape his life from then on out. 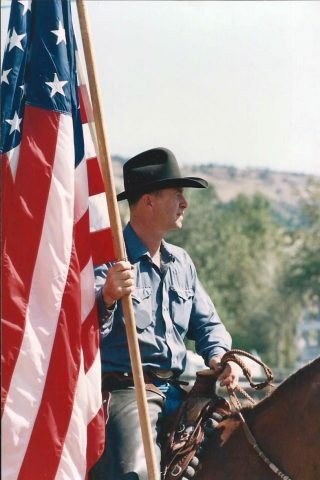 After Patrick’s service in the Marines, he returned to Oregon where he worked on several ranches, learning to braid reins and headstalls in the evenings. It was while he was working on a ranch in Mt. Vernon that he me the love of his life, Shirley Nagel; they were married on June 25, 1976. He was given the opportunity to apprentice under Red Oster to learn the art of saddle making. Patrick would then spend the remainder of his life furthering his art with working knowledge of what a cowboy and horseman needed, also what a horse needed, and took great pride in it. Patrick rode good horses and like to raise and train nice colts especially if they were from his beloved stud Rocky. Patrick was a cowboy, schooled in the old cowboy ways and happiest when he was on horseback. He was a friend to many and a family man. He loved to pass his knowledge on to others, as he knew a horse would greatly appreciate the effort. He is survived by his wife, Shirley R. (Nagel) Lee of Susanville, CA; his daughter from his first wife, Jennifer Lee Hickel of Vancouver, WA; granddaughter Iris Hickel; brother Robert Lee (Glenda); sisters Sandra Pitcher (Randy) and Kathleen Lee (Chuck Coffman); nieces and nephew Deena Pitcher, JaiDeeTaruscio (B.J. ), Carrie Markham (Ryan), Cady Lee, Brian Lee; several great nephews and niece, and many friends in the Susanville area. A memorial will be held at a later date.